What makes a soccer ball "bend" in flight? What determines how far a kicked ball will travel? How do weather conditions and stadium location change the flight of a soccer ball? While NASA is known for rocket science and airplanes, we also love to solve more down-to-earth problems. Researchers and students both like to play and watch the world's favorite game, the game of football. Millions of people from around the world watched the recent World Cup, 2010, from South Africa. Americans refer to this game as "soccer" to differentiate it from the game played with the pointy ball, helmets and shoulder pads. While the shape of the ball is different, both games involve the precise movement of a ball through the air, and both games involve aerodynamics. To help students better understand the aerodynamics of soccer, NASA researchers have taken computer applications designed to study and teach the aerodynamics of airplanes and rockets and applied the equations to soccer. Aerodynamics is the study of forces and the resulting motion of objects as they fly through the air. Judging from the story of Daedalus and Icarus, humans have been interested in aerodynamics and flying for thousands of years, although flying in a heavier-than-air machine has been possible only in the last hundred years, thanks to the Wright Brothers. Aerodynamics affects the motion of every object that moves through the air, including kites, and jet engines. While aerodynamics plays a major role in many sports, such as golf, baseball, ski-jumping, and automobile racing, this web site investigates the effects of aerodynamics on soccer. 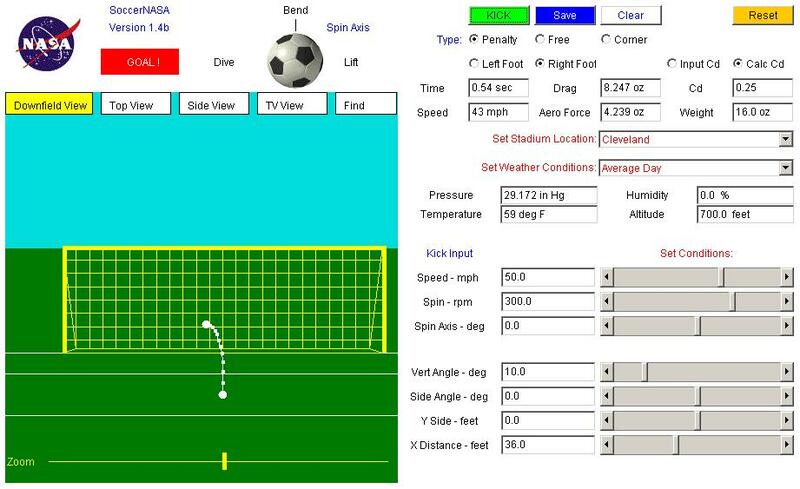 With the SoccerNASA software you can study how a soccer player "bends" the ball and makes it curve through the air by changing the values of the factors that affect the aerodynamic forces on the ball. Factors include the speed of the kick, the direction and angle, and the weather conditions. These are the same factors that affect the lift and drag on an aircraft wing. We add the spin of the soccer ball plus a few mechanics to give you a chance to see how it all comes together. After you study soccer from all the angles, you can move on and explore the aerodynamics of airplane wings and model rockets.